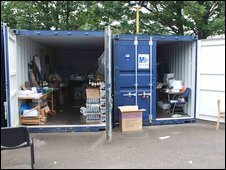 Police have recovered stolen luxury clothes and jewellery worth an estimated £500,000 from containers stored at a north London business park. The seizure is one of the largest in recent years by the Metropolitan Police and followed a tip-off from the public. The haul included designer watches stolen in a raid on the Jura Watches shop in New Bond Street last month. Four men have been arrested, two for conspiracy to steal and two on suspicion of handling stolen goods. Det Insp Frank McGowan said: "This was an excellent, intelligence-led operation by the Westminster Crime Squad." The smash-and-grab raid on the store on 21 July took place in the early hours. It is thought two mopeds or motorcycles were used to escape from the scene of the robbery in Burlington Gardens. Mr McGowan said seven "smash and grab raids" had been carried out on retail outlets in the last three months. But he said this was a lower than the number of similar offences over the same period last year. Two addresses were searched by police and at one of them detectives also found £22,000, he added.